This is Øystein’s first appearance at the New Vic. Television and Film credits include: The Innocents (Netflix); Panther (working title); video game (SIDE studios). 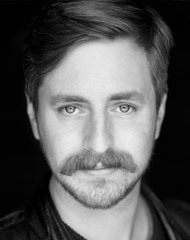 Øystein Schiefloe Kanestrøm is originally from Verdal in Norway, and graduated in 2017 with a BA Acting from The Royal Conservatoire of Scotland (RCS) in Glasgow. Before this he studied drama and theatre studies for two years at Norwegian University of Science and Technology and has had a background in local theatre in both Verdal and Trondheim.